Dan Quigley (James Cagney) is a movie usher who loses his job because he isn’t measuring up to the standards of the boss. He’s late for the line-up at the beginning of his shift, and he’s been caught using the restroom on the mezzanine floor. (Oh, the horror!) He also gets a lot of customer complaints about his attitude. With no legitimate new job prospects, Dan finds that he’s got a knack for less-than-legal activities. Naturally, this leads him to join the mob. But Dan’s mob job doesn’t last long either, and he soon must escape to Los Angeles and go into hiding. Once he gets there, he stumbles into fame as an actor, finding success in none other than films depicting the rough-and-tumble gangster life he used to lead. Dan stays out of trouble with his new-found fame and career, but he can’t erase the past, and soon those demons come back to haunt him. 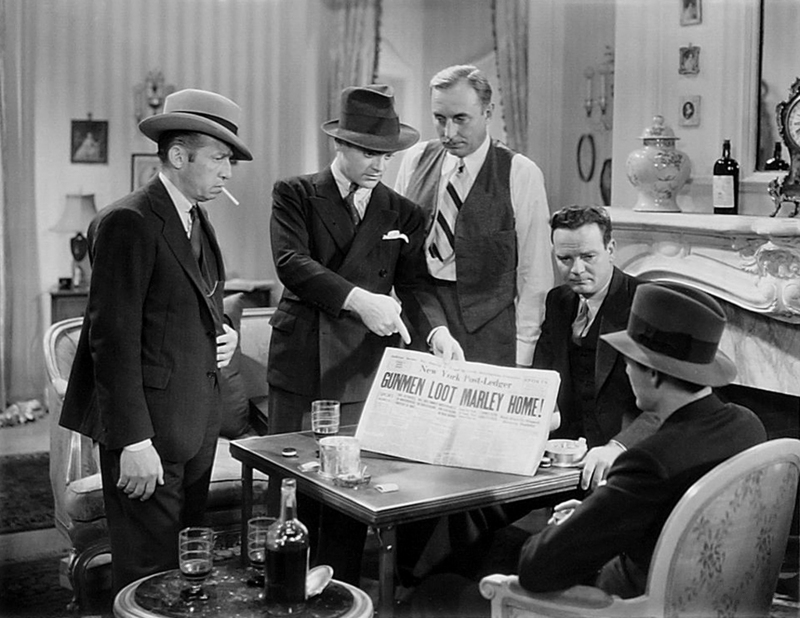 Roy Del Ruth directs 1933’s Lady Killer, a criminal pre-code comedy that spoofs one of the genres that Warner Bros. is most well-loved for by classic film fans: the gangster film. Starring alongside Cagney are Mae Clark and Margaret Lindsay. As an avid fan of the crime drama genre, this film was a whole lot of fun for me to watch. Nods are made to the usual elements of Warner gangster films, but the plot is pushed even further beyond the realm of believability. The jabs aren’t only confined to Warner gangster films, either. Cagney is shown getting a spray tan and putting on a wig in order to play a stereotypical headdress wearing, horse riding “Big Chief” in a Western. Romance is spoofed. The film making process itself is spoofed, as Cagney rides a terrible fake horse in front of a projector screen while being filmed in the “Big Chief” character. Fan clubs and publicity are spoofed. No sector of Hollywood is safe, it seems, when it comes to Lady Killer‘s sense of humor. Gangster films aren’t quite as prevalent anymore outside the realm of classic film fanatics, so while the film’s humor probably would have had much wider appeal in the early ’30s, it now feels like an in-joke crafted, existing specifically for those of us who love classic crime dramas. While the film is very funny, it never goes too far over-the-top. 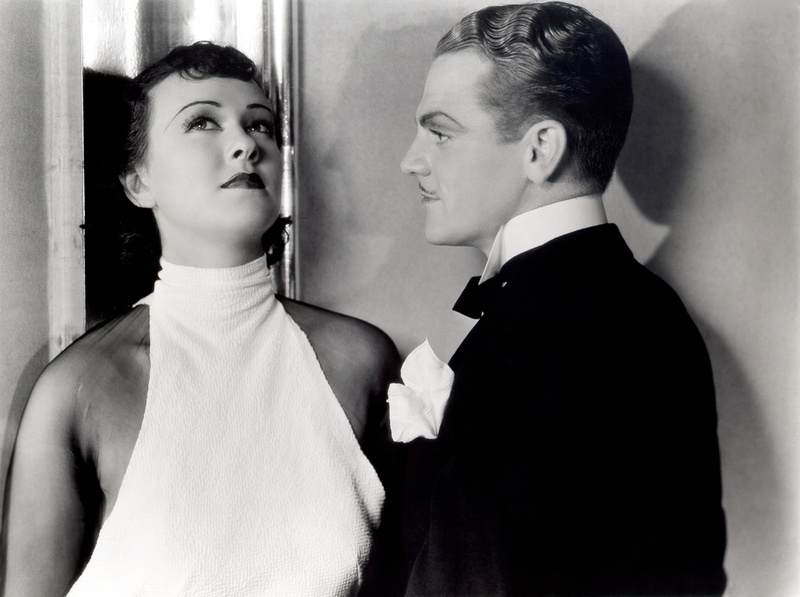 Mae Clark and James Cagney had been seen in The Public Enemy, which is the exact type of film Lady Killer aims to make light of, two years earlier. Mae’s role in the earlier film wasn’t a leading role, but she’s still quite recognizable and together they make a great match for Lady Killer. Margaret Lindsay rounds out the love triangle as Dan’s lovely new Hollywood girlfriend, and she’s equally great for the role. A movie poster featuring Edward G. Robinson is shown early in the film, foreshadowing the illegal events to come. 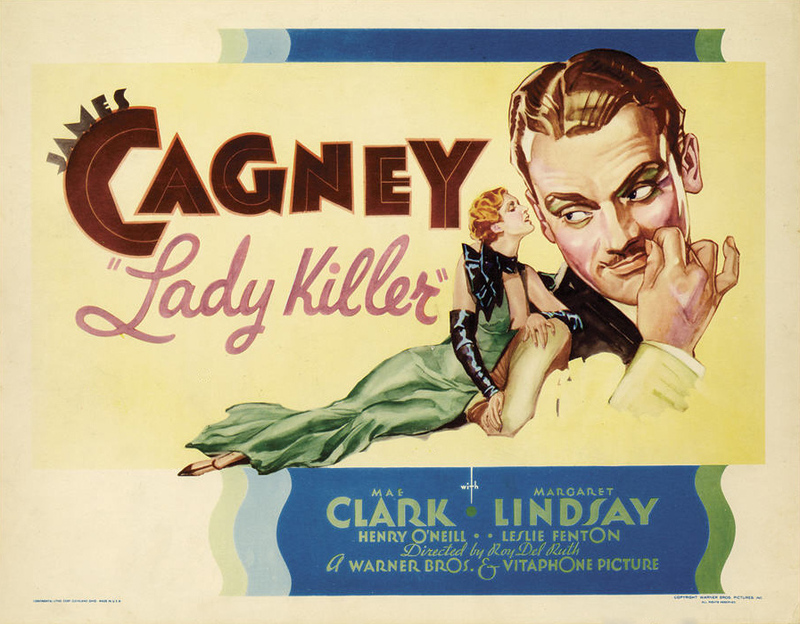 Cagney’s character predictably moves in and out of society’s underbelly, but that predictability does nothing to harm the film because it isn’t trying to take itself seriously. Cagney’s performance, of course, is wonderful. He pulls off the somewhat silly, exaggerated aspect of his character while also providing serious tension in some of the scenes. This mix makes it very easy for the viewer to appreciate the film’s humor while still getting wrapped up in the story. For all of its silliness in the “spoof” aspect of the story, Lady Killer is incredibly fast-paced and full of action. Clocking in at only an hour and fifteen minutes, the film never has a dull second, and a surprisingly great amount of high-energy moments are thrown in during those 75 minutes. It would have been pretty easy for the film to get boring since it does follow the conventions of the genre so closely, but it remains amusing and fun throughout its entire running time. This looks like sooo much fun! I’ve seen this on the TCM schedule occasionally but have never made the effort to watch it. Shame on me! The next time I see it on the schedule, I’m setting the DVR. Hope you get the chance to see it! I’d really love to add it to my DVD collection soon.